Area law enforcement officials recently honored two Philadelphia archdiocesan priests for extraordinary service in their communities. 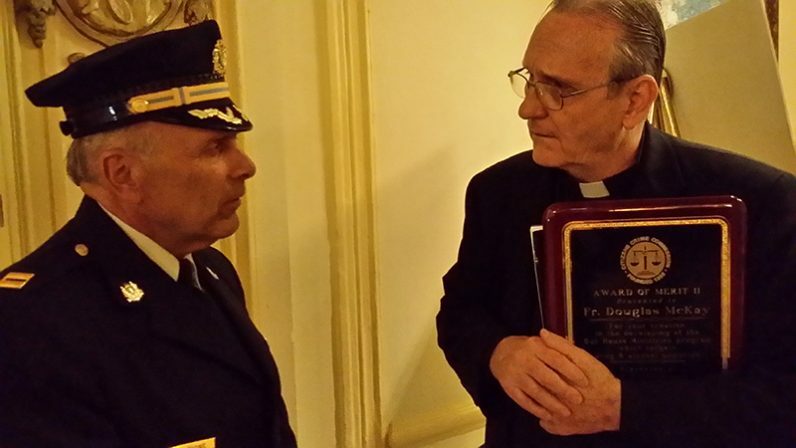 Father Douglas McKay, who has spent decades ministering to those struggling with addiction, received the Citizens Crime Commission’s Award of Merit II at the organization’s 37th annual Law Enforcement Appreciation Day May 23 at the Hyatt at the Bellevue hotel in Philadelphia. Pennsylvania Attorney General Josh Shapiro delivered the ceremony’s keynote address. Father McKay was one of only five civilians honored at the event for his work, which has long helped to combat the systemic issues of substance abuse and crime in the city’s Grays Ferry section, where he was raised. Also honored at a separate ceremony among law enforcement officials May 10 in Montgomery County was Father Jerome Wild. The pastor of St. Teresa of Avila Parish in Norristown was recognized by Montgomery County District Attorney Kevin R. Steele for counseling a suicidal man at the church last year and dissuading him from taking his own life. 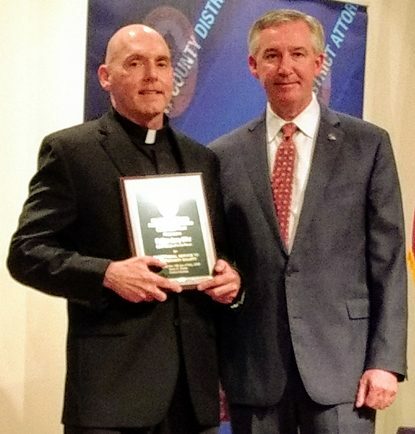 Father Jerome Wild stands with Montgomery county District Attorney Kevin R. Steele, who awarded the archdiocesan priest and pastor of St. Teresa of Avila Parish. Norristown, with a special commendation for community service May 10. Father Wild was presented with a Commendation Award for exceptional service to Montgomery County. Father McKay founded Our House Ministries, which provides recovery homes and faith-based sobriety programs, shortly after losing his own brother to an overdose. Now in its 21st year, the outreach – located across the street from St. Gabriel Church in Philadelphia – has been “very effective for the community,” said Philadelphia police captain Louis Campione, who nominated Father McKay for the award. In his ministry, Father McKay stresses the importance of the sacraments, particularly the Eucharist and confession. Mass is celebrated on weekdays in one of the ministry’s three chapels, two of which are named after St. Gabriel’s fellow archangels, St. Michael and St. Raphael. The third chapel is dedicated to Venerable Matt Talbot, an Irish ascetic and recovered alcoholic whose intercession is widely invoked by those seeking to overcome substance abuse. The Angelus, adoration, benediction and other devotions are also observed daily among the three locations. Residents of the recovery homes must attend Sunday Mass and weekly gatherings of the Calix Society, an international Catholic lay organization for participants in 12-step programs. Father McKay has always seen the battle against addiction and its attendant ills as primarily spiritual in nature. While giving the benediction prior to the awards luncheon, he recalled the police sirens that have been a soundtrack to his life and work in Grays Ferry. Three years ago, Father McKay and the Our House team began their own law enforcement appreciation day, serving a mix of hoagies and holiness to neighborhood police. Despite being the author of two books and the host of the “Saints and Sinners Radio Program” on In His Sign network, Father McKay is reluctant to accept any kind of recognition for his work. “He doesn’t really like it, but he does it for the ministry,” said his sister, Joann McKay Stewart, who attended the May 23 ceremony with about a dozen Our House supporters. God bless Rev. Father Philip Forlano ; St. Charles Borremeo parish in Bensalem, is sooooooo fortunate to get such a wonderful priest! God Bless our Priests and Police.